Our dashboard for merchants gives you complete control over your account. You can edit and manage every aspect of your account, from uploading your company logos, updating addresses and phone numbers to setting default messages for your customers. The dashboard also gives you access to change critical settings and configurations of your merchant account. All this can be done without any manual intervention from PayBhutan. 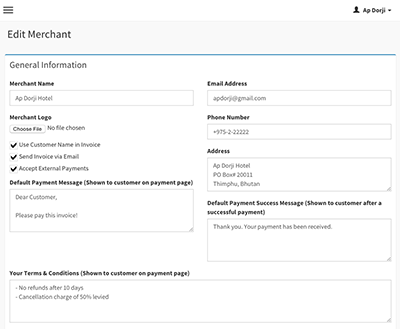 The first step towards receiving payments is generating an invoice for your customer. 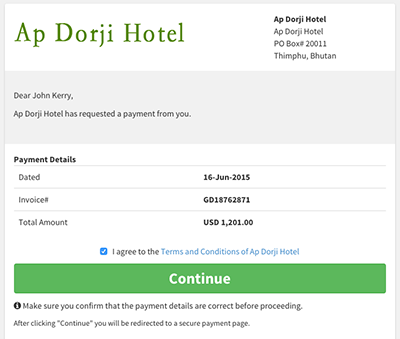 With PayBhutan, this process has been reduced to a single step. Invoices can be created in two currencies (INR and USD) and can be generated with customized messages for each one of your customers, making it personal. Right after you login to your dashboard, a list of all your invoices is displayed to you. 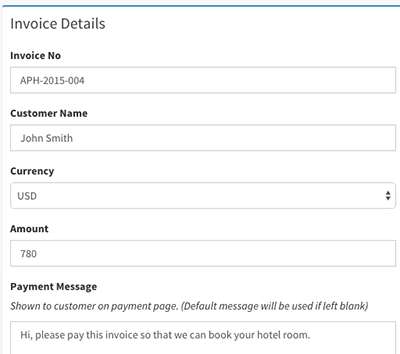 Your whole history of invoices and transactions is available at a click of a button. Easily readible reports, filtered by dates can be downloaded to your computer or mobile device for offline reference. After creating an invoice, you will have to send it to your customer for payment. What easier way than to send it by email. 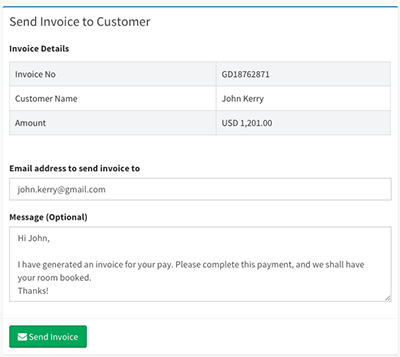 From your invoice manager panel, you can send it to your customer's email address along with a personal message for them. Upon proceeding to the payment, your customers are greeted by a great looking payment page, carrying your company logo, personal messages and your terms and conditions. This makes sure that your customers are paying to you and no one else. Lets get you paid online, contact us today!